Windows 7 RC (Release Candidate) version 7100.0.090421-1700 has been released by Microsoft to general public for free download. Download of Windows 7 RC DVD ISO image through official Microsoft Windows 7 RC homepage is likely to be offered through Akamai Download Manager ActiveX control of Java applet. Akamai Download Manager offers advantage of resume download in case of premature or pre-complete connection termination. For those who prefer to download directly the ISO files through HTTP connection without Download Manager, use the Windows 7 RC direct download links below. Note: Microsoft may check for referrer and redirect direct download request to Windows 7 homepage. In this case, just copy and paste the full ISO download URL to address bar and hit Enter to start the downloading. The released edition of Windows 7 is Windows 7 Ultimate. It’s also possible to download Windows 7 RC ISO via torrent. Do also check out Windows 7 system requirements to see if your system hardware supports Windows 7. And read the Windows 7 RC Release Notes and What’s Changed in This Release Candidate of Windows 7 document, which supplement the previous details on the changes for Windows 7 RC since Beta. 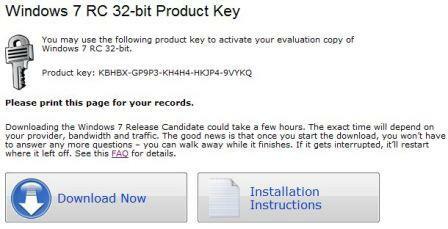 Microsoft also provides free product key to activate Windows 7 RC. Beside, direct build-to-build in-place upgrade from earlier pre-RC or Beta phase of Windows 7 is not allowed. For users who insists on upgrading instead of fresh installing, use this hack to allow Beta upgrade to Windows 7 RC. For users who want to translate Windows 7 to international languages, the MUI Language Interface Packs (LIP) for Windows 7 RC is available for download.